Argentina suffered a major setback on Thursday when they lost to France by 3-5 in the last round of their Pool A match at the World Cup. 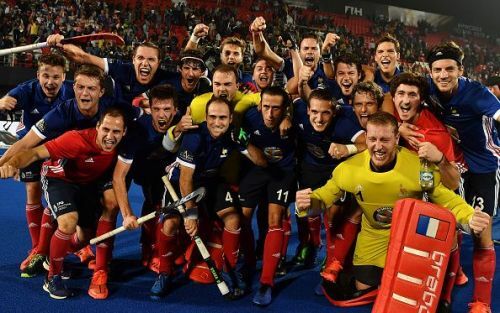 The match should easily be termed as the upset of the tournament as the lowest ranked team defeated the highest ranked team and moreover, Olympic goal medallists. With their two mind-blowing performances, Argentina have already garnered a huge number of local supporters, who were vociferous at the Kalinga Stadium in Bhubaneswar whenever an Argentine player touched the ball. But the crowd support could do little to change their fortune. Argentina have already secured their passage straight to the quarter-finals and this was not more than a practice match for them. But they would’ve surely loved to make it three out of three. France probably saved their best against Argentina as the result kicked Spain out of the tournament, who finished last having only two points in their account. Hugo Genestet, Victor Charlet, Aristide Coisne, Gaspard Baumgarten and Francois Goyet scored for France while for Argentina, Gonzalo Peillat scored a brace and Lucas Martinez scored the other. Argentina is a team that boasts some of the best defenders to have played the game. But in this tournament, their defensive frailties are exposed rudely. Against Spain, they’ve conceded three goals and France utilised the opportunity fully to pump up five goals. Take the example of the first goal. Hugo Gentset dribbled past a couple of defenders so easily on the left side to enter the circle. From there, his was shot was deflected off Gonzalo Peillat’s stick before finding the net. The way Argentine defenders allowed him to come to the D box was shocking to see. They should’ve tackled him before. Argentina defence completely went missing when Timothy Clement split a pass at the near post which was lofted over the goalkeeper by Aristide Coisne. They made the Olympic champion a school team at that moment. The same thing repeated during the fourth goal. Gasper Baumgarten’s initial shot was saved by Juan Vivaldi but the rebound off Charles Masson was deflected by Baumgarten. At least four Argentine defenders were there and none of them went to stop Masson from taking the shot.